Ring out the old, ring in the new. The year is dying, let it go. Another year is here once more. And thus speeds on the wheel of time. Giving to this year a mighty four. Time flies, even here at home, where there is nothing much doing, the days quickly pass. My new year was spent at home in the usual manner. I agree with Grandma–Time flies! New Year’s Day is a good time for reflection. We are now three-quarters of the way through the diary. Grandma kept her diary for exactly four years—she began it in January, 1911 and the last entry was in December, 1914. I’ve enjoyed getting to know Grandma better via this blog. And, it’s been wonderful re-connecting with relatives and making many wonderful new friends. Use the information I’ve compiled for this blog to write a book about Grandma?. . .or maybe a cookbook of hundred-year-old recipes updated for today? Continue the blog, but without the diary, and instead focus on hundred-year-old magazine pictures, stories, and ads? Select a different relative. . .and a different time period, and then tell their story on a blog over the course of a year or two? . . maybe using a handwritten cookbook as a jumping off point?
. . . or maybe doing something entirely different? It’s been a wonderful three years. Thank you! I look forward to sharing the final diary entries this year, as well as occasionally brainstorming ideas for my next project. Posted on January 1, 2014 December 31, 2013 by SherylPosted in HolidaysTagged family history, genealogy. Well my hope is that you will continue the blog in some way. All the best in 2014! I have so much fun with this blog, that I feel almost certain that I’ll continue blogging in some way. I just need to figure out how. Happy New Year! All your ideas sound interesting. And of course, I would love to see the blog continue beyond 2014 as I enjoy reading it so much. Thanks for the kinds words. 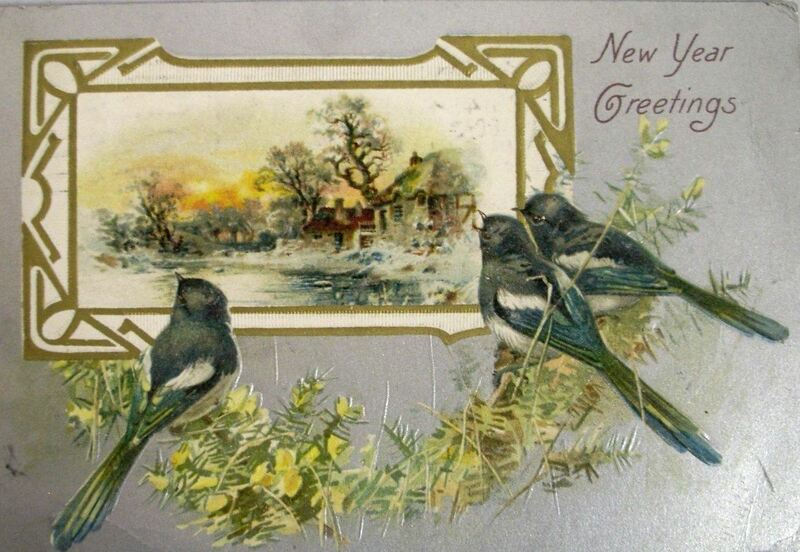 I also hope that you and your family have a wonderful 2014. Happy New Year! I appreciate your thoughtful comment. I recently was going through some of my old posts looking for something, and was amazed (well, I knew, but don’t usually thing about it) how many posts there are. Happy New Year! I have enjoyed the diary so much. You have really put a lot of work into it. I’m glad to hear there is another year coming! Thank you for the kind words. I have a lot of fun doing the research and preparing the posts for this blog. Happy New Year! And I, too, hope to go back to the point where I discovered your blog, and read the previous diary entries. I will be here to see what unfolds in the coming year. Happy New Year. Happy New Year! I do hope you’ll continue. Happy New Year! I feel pretty sure that I’ll continue blogging in some way. Looking forward to the next years posts and whatever you decide to do after that. Happy New Year! I appreciate you comments, and have enjoyed getting to know you via our blogs. Happy New Year! I feel kind of sad about it too Sheryl! I bet if Helena lived in our time she would have had a 4-year blog! Did you have this idea for some time but they you had to wait until Jan 2011 to make it exactly 100 years? That waiting would have killed me! Well depending on how long you had to wait…. Happy New Year Sheryl! Happy New Year Helena! My daughter’s question reminded me that I had the diary, and I dug it out of a cupboard. I was surprised that the first entries were written almost 99 years previously–and I started thinking about posting them at 100 years. Since I’d never done a blog before, the year went quickly. By the time I’d figured out what I was doing, it was almost time to start posting them. What an awesome back story Sheryl! I will go check out the about page! Happy New Year Sheryl. I have really enjoyed your commitment to getting your grandma’s life ‘out there’ and am glad to hear there’s another year to come! Thank you for your kind comment. I’m also glad there’s another year. Happy New Year! All sound like good choices to me. Just make sure you keep going! 🙂 Happy New Year! As a relative newcomer to your blog I’m sorry to think you’ll stop in a year – you have such a wealth of material here – perhaps you could create a story with it using your Grandmother as the central character? Thanks for the suggestion. I’ve never written much fiction–but maybe it’s something I should try. Happy New Year! I prefer 2 and 3 above so that you keep blogging :). Happy New Year, Sheryl! And, Happy New Year to you! Your comment is very kind and perceptive. Thank you! As far I know she did not pursue poetry after the diary ended. The only writing of hers, other than the diary, that I’ve ever seen are a few letters. Continue your blog with what you know about Grandma’s life. Don’t leave us hanging! 🙂 She has become family to me! Thank you for the kinds words. Unfortunately I don’t have enough detailed information about her life after the diary ends to keep it going very long. I may do a few posts summarizing the last 65 years of her life. And, I look forward to sharing 1914 with you and the other readers. Have a wonderful 2014! I hope you continue with blogging beyond the diary in some fashion! Happy 2014! Thanks for the kind comment. Happy New Year! Can’t wait to see what 2014 holds for Helena, and you! I think you could continue with the rest of what you know of Helena’s story but I bet there are other directions you might like to try, too. I can’t see you giving up blogging! This might sound strange, but I don’t have very much information about what my grandmother was like during the years that took place between the time of the diary–and the time that I can remember her. She married a farmer/businessman and became a homemaker and mother. Most of the artifacts that I have from this era focus on my grandfather rather than her. Actually, that doesn’t sound strange at all–when I think about my own knowledge of my grandparents, I come up pretty blank. Just acknowledging that makes me a little sad . . . I agree too, time flies. Happy New Year!!! PS I can’t wait to see what you do when the diary is over! Maybe reflect on what grandma’s life after the diary too. Thanks for the thoughtful comment and suggestion. Happy New Year! Thank goodness you have a year to figure out your next step! Happy New Year! Cheryl, Happy New Year! I like your idea for continuing the blog and delving deeper into the time period the diary covers. A cookbook sounds great as do illustrations from the magazine. You might be able to gather family lore or local information during the research. As time goes on there will be an even deeper and more vivid picture of the time span the diary covers. You may even want to write that book about your Grandmother. I’m thinking of how the “Country Diary of an Edwardian Lady” took off in the early 1970s. It contained the watercolors and sketches of early 20th century artists Edith Holden. The diary also had text entries that briefly covered what the sketches were about or how she spent a day. Several books followed the release of the Diary that went further into her life and the people she studied with and so on. Thanks for the suggestions. I’ve never heard of the Country Diary of an Edwardian Lady. I’ll have to look for it. It sounds interesting. Here is a lovely review of the Country Diary of an Edwardian Lady http://fleurfisher.wordpress.com/2013/12/29/the-100th-book-of-the-century/ I am sure you could manage a beautiful book based on your grandmother’s diaries and everything you have learned. And I am sure there will be lots of other ideas you could explore, too. Thanks for the link and suggestions. The book looks really good (and I love the gentle, soft-toned pictures). It’s amazing how it was published so many years after it was written. Sometimes doing this blog makes me think back to the papers I wrote when I was a student. Each day’s post almost seems like an index card filled with notes–the trick is to figure out how to re-order them to create something longer that is interesting and make sense. I’m going to have to mull this over some more. I too will be sad when Dec comes around and there will be no more priceless words from Miss Muffly… but it’s been an absolute joy. Thank you so much Sheryl and may the New Year fill you with happiness. And, I have so enjoyed your wonderful comments throughout this blog. Happy New Year! All those ideas sound great! I enjoy your blog and hope you continue it in some way. I have so much fun doing the posts, and interacting with wonderful people like you via our blogs, that I think that I’ll continue blogging in some way after the diary ends. I’m just trying to get my head around what it will be about. Stay tuned as I work to figure it out. And, Happy New Year to you. I’m sure you’ll find your voice Sheryl. You have so many regular visitors who’ve followed your grandma’s story. What did your Grandma do after 1914, I would love to hear about life after the diary. She became a homemaker and mother. I think that she focused primarily on her family for the remainder of her life–which is good but she didn’t leave a lot of artifacts from those years. People who remember her talk of her kindly, but I don’t have the detailed information about the remainder of her life that I have for the diary years. Oh! I’ve only very recently discovered your blog and am dismayed to realise that this diary and yourfascinating commentaries won’t go on for ever. I think you will know which direction will attract your interest in good time. Just so long as you DO continue…. All good wishes for 2014. I think that you’re probably right that I’ll figure out what to do in good time. Have a wonderful New Year! Happy New Year Sheryl! I admire your commitment to doing a post a day for three years, with so many fascinating themes to accompany the diary? All your ideas for the future are good ones. I think they will percolate through the year and you’ll know what direction to take…one or more maybe. I like the idea of letting them percolate through the year. Happy New Year! You definitely have some good options. I have at least three big trips for new material. Australia, Argentina and Turkey. Wow, you have trips scheduled to some really interesting places. I look forward to reading about the trips on your blog. Happy New Year! Thanks for the kind words. Have a wonderful New Year! Happy New Year Sheryl! I think you should begin your own daily diary to be read 100 years from now, and using your blog as the “journal.” Include your own recipes, refer back 100 years, and tell it like it is today in your life and include your own family traditions. What an intriguing idea! In the past, I’ve occasionally thought that I should keep a journal, but never considered doing it as a blog. Happy New Year! Happy New Year! Thanks answer on a previous blog entry. I liked McCall’s Magazine as a kid and especially the ‘MackCall’s’ version in the early 1960s edited by John Mack Carter. The paper dolls, the fashion and the Breck girl!